My Grandmother made stuffed peppers at least one a month when I was growing up. But for some reason, it took me many years to realize that I had no idea how she made them. What I have discovered in my personal quest to document some of her recipes is that getting her to write these things down is like pulling teeth. Seriously, I’ve had to badger her, which is not at all how I was raised to treat my elders. But I do what I have to. She didn’t say how long to cook them or specify a temperature. When I asked her about it, she said “oh you know, 350 degrees for about 20 minutes.” Nope, I didn’t know that. Can you write that down too? So she did. And I set about transforming that list into the stuffed peppers you see at the top of the page. Overall, I think I did pretty well. The key is definitely to par-boil the peppers to soften them up. And, don’t hate on this, to use ketchup in the topping. I’m sure tomato sauce would work just as well but the stuffed peppers that I grew up with had ketchup on top. It’s just what tastes right to me. And it justifies keeping an otherwise unused condiment in the refrigerator. BAH Note: My grandmother (MamMom) always used Minute Rice (and can I tell you how long it took me to realize that not all rice cooks in only 5 minutes?). I find that I have followed in her footsteps and rely a lot on Uncle Ben’s Ready Rice packages. It’s basically precooked and packaged so that you only have to reheat and eat. I absolutely rely on it for brown rice, which I find to be a ginormous pain to cook, and it is what I used in this dish. You can easily substitute white rice, just be sure that whatever you use is cooked before it gets mixed with the ground beef. Heat oven to 350 degrees and place a rack in the middle position. Set a large pot of water to boil over high heat. Either cut the peppers in half longways or cut the top off (your choice) and remove all seeds and ribs. When the water just comes to a boil, add the peppers and parboil for 5 minutes. Remove peppers and let them drain on a paper towel or cooling rack. In a large skillet, lightly brown the ground beef until it is no longer pink. Using a mesh strainer set over a bowl, strain off any fat. Return the ground beef to the skillet, add the rice, and stir to combine. You want your mixture to be more ground beef than rice . Add salt and pepper to taste. 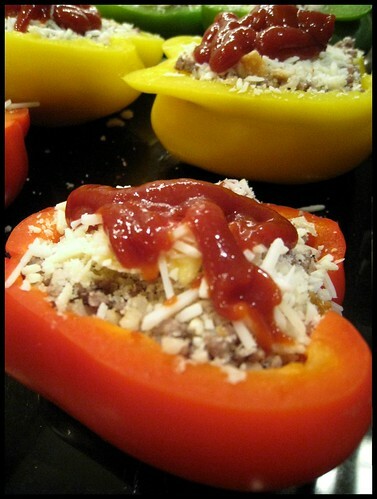 Arrange your peppers in a baking dish and fill with the ground beef and rice mixture. Top with a good squirt or two of ketchup (or tomato sauce) and sprinkle bread crumbs and grated Parmesan cheese on top. And that is the step that is often missed. One must parboil the peppers. That is just the information I needed. It makes perfect sense. I learned something new today. Thank you, Wendi! Tracy, the first few times I tried to make stuffed peppers I didn’t parboil them. And they were awful. It took me years to decide to try them again. Emily, par boiling the peppers is the key to them being tender. I promise. I love stuffed peppers! But I must confess, when I get a craving for them, I just buy the Stouffer’s ones! Wendi, any ideas on if these would work with ground turkey? Beth, I’m not skilled in the ways of ground turkey but I would guess that if you used ground dark meat, like thighs, instead of breasts you might be ok. You might want to also parboil the peppers a little longer and cut down the oven time so that the meat doesn’t completely dry out. Maybe a mixture of ground turkey and some lean beef would work? The spouse is not a fan of ground turkey. I have been mixing in a little of it with my ground beef. So far, he ahs not noticed. LOL SHHHHHHHHHHHHHHHH! J – you have no idea how hard it was to get the old girl (and I say that with much love and respect) to give me anything that even came close to a recipe.